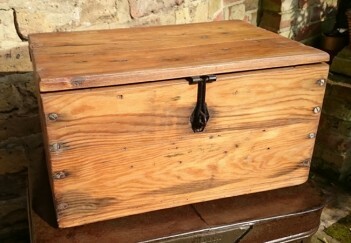 This antique pine box is interesting. We have cleaned it up considerably from its original condition (take a look at the before photo), and we love how historically these were made up from any pieces of wood that were lying around. So in this case the sides are actually mahogany, and the top has come off a crate. The top was not in good shape so we have replaced two sections of it with new timber and stained it to blend in. The whole things, has been sanded, cleaned, polished and waxed. 40cm wide by 26cm deep and 22cm tall.